The Military Justice is recognized by the Peruvian Constitution as an exceptional jurisdiction that acts within the Defense and National Security System of Peru. The Peruvian Constitution established the armed forces to guarantee the independence, sovereighty and territorial integrity of the Republic. The Peruvian Constitution established the armed forces to guarantee the independence, sovereighty and territorial integrity of the Republic. It further established the National Police forces to guarantee, keep and restor internal order. The Military and Police Court is part of the Institutionalism of the Peruvian State. Both its existence and liability scope are ruled by the Peruvian Constitution, which grants the court the status of independent jurisdiction, exclusively committed to the administration of justice according to the Code of Military Justice. The Peruvian Constitution further establishes jurisdictional unity and recognizes the independent nature of Military Justice as a specialized jurisdiction to administer justice within the scope of the Military and Police, in order to strengthen discipline. The Military Justice is recognized by the Peruvian Constitution as an exceptional jurisdiction that acts within the Defense and National Security System of Peru. Section 138°. The power to administer justice comes from the people and is exerted by the Judiciary through its hierarchical organisms according to the Peruvian Constitution and the laws. In any proceeding, in case of existing incompatibility between a constitutional rule and a legal rule, judges will choose the first one. Likewise, they prefer the legal rule above every other rule of lower rank. It does not exist nor may be established any independent jurisdiction, except the military or arbitration jurisdiction. Section 140°. Death Penalty may only be applied for the crime of treason to one’s country in times of war, and terrorism, according to the laws and treaties in which Peru is a party. Section 141°. It corresponds to the Supreme Court to resolve in cassation or as a last resort when the action is filed at the Court of Appeals or at the Supreme Court itself, according to law. Likewise, we know in cassation all resolutions of the Military Jurisdiction, with the limitations provided in section 173º. Section 165°. The Armed Forces consist of the Army, Navy and Air Force. Their main purpose is to guarantee independence, sovereignty and territorial integrity of the Republic. They assume the internal order control according to section 137º of the Peruvian Constitution. Section 166°. The purpose of the National Police of Peru is to guarantee, keep and restore internal order. It provides protection and assistance to the people and community. It guarantees the fulfillment of law and security of public and private assets. It prevents, investigates and fights against crime. It watches over and controls borders. Section 168°. Laws and regulations according to Section 167°. The President of the Republic is the highest authority of the Armed Forces and the National Police Force of Peru. They establish the organization, duties, specialty, preparation and employment; and they rule the discipline of the Armed Forces and National Police Force of Peru. The Armed Forces organize their reserves and dispose of them according to the needs of National security of Peru, according to law. Section 169°. 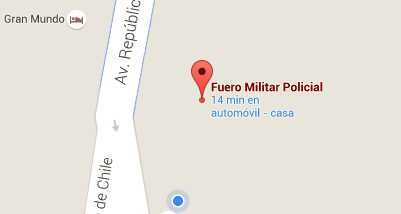 The Armed Forces and National Police Force of Peru are not deliberative. They are subordinated to the constitutional power. Section 171°. The Armed Forces and the National Police Force of Peru participate in the economic and social development of the country and in civil defense according to law. Section 173°. In case of offense in the course of duty, the Armed Forces members and the National Police Force of Peru are subject to the respective jurisdiction and to the Military Justice Code. These regulations are not applicable to civilians, except in case of crime for treason to one’s country and terrorism provided by the law. The cassation referred to in Section 141º is only applicable when the death penalty is applied. Those who infringe the rules of the Mandatory Military Service are also subject to the Code of Military Justice.